Reading Secret Wars month to month was an exercise in frustration that I nevertheless enjoyed participating in. Up front, I'll say that it isn't perfect. There are a few too many catch-up exposition monologues (mainly put in due to publishing delays) and a couple of plotlines that have too much happening off-panel. In particular, Captain Marvel takes a weird turn through the middle of the book that never got picked up in one of the spin-offs as far as I can tell. There's also some strange issue placement in the hardcover; the Free Comic Book Day story that should be at the very front is instead at the very end. 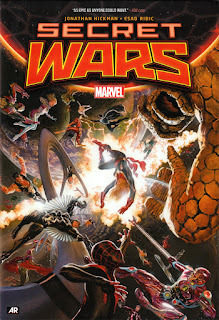 Even with these flaws, Secret Wars succeeds both as a culmination of five years of stories by Jonathan Hickman as well as a somewhat effective way to refresh the Marvel Universe. As you might expect, spoilers await! The first issue of Secret Wars starts right as the final issue of Avengers: Time Runs Out ends. It's actually mandatory that you read those lead-in issues because Secret Wars hits the ground running with the Ultimate Universe already invading Earth-616. Most of the central characters of the crossover carry over from the "Time Runs Out" storyline, with the notable additions of Star-Lord and both Spider-Men. For a battle where all sides are guaranteed to lose, the heroes of the mainstream Marvel universe go out swinging, with Colossus actually sending the Hulk through the air with a Fastball Special. But in the end, the words of Hickman's overall story arc come true: "Everything Dies." The Incursion of the last two Earths is followed by a page reading the birth and death dates of both universes. Of course, existence is far from over for the Marvel heroes. The second issue follows one young man around as he becomes one of the Thors, an enforcer of the God-Emperor Doom, who created their world. It's eventually discovered that Doctor Doom created the new "Battleworld" out of the flotsam and jetsam of previous destroyed universes, using the Molecule Man as a bomb to kill the Beyonders and take their power. Most of that was easy to figure out early on; what's new is learning that Doctor Strange was there the entire time and was complicit with Doom taking charge, a decision he later regrets. That part validates the sometimes out-of-place Rabum Alal subplot from "Time Runs Out." We meet far more than the Thors in issue two, as he and his trainer visit Doom's court to watch a squabble between regional barons. Putting a feudal system into place is quite in character for the new God-Emperor and I'm kind of impressed that he didn't automatically make all of the barons from the ranks of supervillains. This case is the trial of Jamie Braddock, the Ultimate Captain Britain from Hickman's Ultimate Comics run versus the gleefully evil Mister Sinister. Should Hickman return to Marvel in the future, I hope he finds a way to use Sinister again, because I really enjoy the egotistical portrayal he has here. We're introduced to the protective Wall, which is clearly a riff on the one that keeps the White Walkers out in Game of Thrones, when Jamie is banished there as part of the trial. Hickman sets up multiple mysteries running through Secret Wars to which the reader has some of the answers. The Thors find a life raft that the Cabal used to survive the Incursion; a matching one containing some of Earth-616's heroes was found by Doctor Strange years earlier. Both sides are released believing only an hour has passed; one of the Thors gets killed for his trouble, which is the first crack in the police force's armor. It's in fact been eight years since the creation of Battleworld and the spells used to create it keep unraveling. The last thing Doom needs is two groups of people who remember how the universe used to be, especially when one group counts Thanos and Maximus the Mad among their number. Being the God-Emperor of all reality brings out the best and worst in Doctor Doom. He does show some mercy but is still quick to react with anger whenever things don't go his way. You can see just how badly Fant4stic got Doom's character wrong by having him want to destroy the world; here, he uses all of his energies just to keep a shred of it alive. All the same, it takes a moment to realize just how creepy Doom can get when you take a look at what happened to the Richards family; he's taken Sue as his wife and Franklin and Valeria believe he is their father. How much of this is a legitimate attraction to Sue and how much is it him just trying to best Reed Richards even when he thinks Richards is dead? Keep in mind that Doctor Doom once skinned the woman he loved to make a suit of armor ... and he could easily have used his godly power to recreate her instead. Next week, I'll take a look at the character arcs of the heroes and villains who made it through the Incursion and discuss how Secret Wars was helped and hindered by its tie-ins. Some, like Thors, ended up being must-reads, while others, like Captain Marvel and the Carol Corps, just make confusing plot points even harder to understand.